Could midlife crisis be checking in a little too early? | Life, oh life! 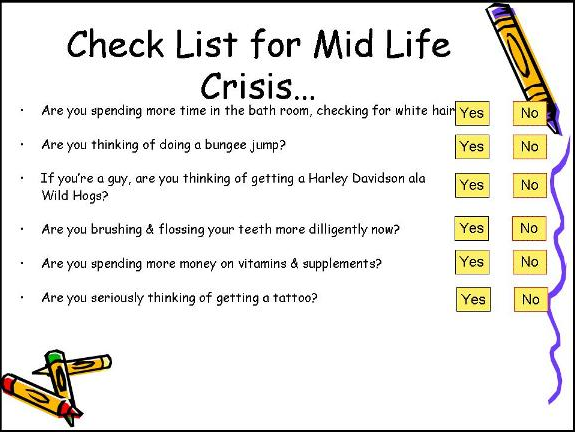 Could midlife crisis be checking in a little too early? Do you remember when you were a kid? When you wanted to become a doctor, a nurse, a driver, a teacher, a dancer, a farmer, a pilot, a captain and maybe a butcher like my cousin once told his mother. I laugh at him every day when I remember that. It is good to have your kids hang out in sophisticated places where they get exposed to all manner of things such that they can imagine greatness. My cousin is all grown up now and he is studying electric engineering, I just hope an electric engineer was what he had in mind when he was in high school. I also had such dreams, I wanted to become an accountant, I wanted to become a pharmacist, I wanted to be an IT technician immediately after high school and now I want to be a hairdresser, weird, huh?! I know, in fact I know I sound like a lost soul and I think I am. I am at that point when I want to try everything under the sun; you are not going to believe me when I say I want to go bungee jumping but I doubt I want to have my heart stop before its time. I want to register for a marathon one of these fine days; I hate running but I will challenge myself. I don’t intend to run like my whole life depends on it. All I want is to challenge myself and get to meet new people and see how much I can stretch my body. Besides, I know there are people who have been training for marathons for the better part of their lives and I don’t intend to compete with them. Even if I compete, there is no chance in hell that I will get to position 100. However, if I get to position 100, he he, I will reward myself. I want to go kayaking never mind I can’t swim to save my life. Talk about misplaced priorities, I haven’t learnt swimming yet. I tried learning the art of walking on water but immediately my friend relocated to the land of opportunities I lost interest. Besides, she was my cheerleader and at least by the time she left I had learnt how to float on water and flap water a little, ha ha ha! I know, I need to learn to swim from one side of the pool to the next but on the shallow end of the pool. I still need me so I am not going to drown myself in the name of learning to swim by venturing into the middle of pool. It is too unfortunate I was too girly when growing up and it is even worse there were no boys to grow up with which means I only went near the river when the taps ran dry. I was too timid to follow my tomboy girlfriends for a swim in the river when I was young. Those ages where I come from there were no swimming pools and I doubt there is one even now, you have to take two vehicles to get to the swimming pool he he. Anyway, I know I need to take the advantage of sun while it is still shining to learn how to swim so that come kayaking time, I will be fully equipped. You only live once and you might as well take advantage of the good health before you can’t lift your leg one after the other. The next thing on my bucket list is climbing Mt. Kenya. I want to see the sun come up over the hills up there. I want to see the snow shining under the sun. I want to see how many hours I can walk without collapsing. I know it is a tasking affair but I am determined to do it. I want to look back one day and pat myself on the back for having lived a fulfilling life. It is going to be sad if I look back and realize there is nothing much I have accomplished. I know climbing mt. Kenya is not going to benefit anyone but at least I will have conquered one of those things I loathe; walking. I can only walk for a short distance; I am starting to believe I am too lazy for my own good. Can you imagine there was a time I used to board a matatu for a 10 minutes’ walk distance….Yes, my laziness (well, walking laziness) was and it still is that bad. I want to conquer that this year but I am hoping to do it on December when it is all shining and the year is almost over. Mt Kenya region can really get cold and wet for the next few months and I don’t want to lose any of my body limbs from freezing. Soon I am going for a karaoke night but I doubt I will have the guts to have all those eyes watching me and listening to me. It is one thing to talk to your friends, you know, to have them listening to one of your stories. It is completely another to have a crowd of complete strangers listening to you and some of them high as a kite. You know how nasty drunk people can get. Anyway, I am going to try it soon never mind my friend told me I cannot sing to save my neck. I am however going to prove him wrong although this is to conquer my own fears and not to prove anything to anybody. In fact, I haven’t partied or binged on illegal stuff for some time, so this is my chance. Did I say every time I go to church I want to join the choir, they sing so well and I cant help thinking how fast I need to join them. I also want to learn how to play the guitar, I want to learn how to play the piano, the flute, the drums and sigh! I want to learn how to play the violin. I wonder what else I want to learn because every day there is something I see and I think to myself, mmmhhh…I need to do that, mmmhhh…… I should have learnt to do that. I want to travel to Mombasa or to some other place in a train and then come back on a plane….Yes, my dreams are still valid. I cant even tell you why I need to go through the torture of sitting for almost 12 hours but the heck, why not. It is a good experience to see the nature. I guess there is a thrill of being out in the wilderness with strangers and not knowing what will happen. I mean we can only care too much. Sometimes it is good to let caution out of the window because if anything was to happen, it will happen anyway, there is nothing much I can do about it. I want to sleep in Nairobi and wake up in Mombasa, but I would rather travel during the day; there is a lot to see during the day. And again, If God forbid, the poop hits the fan; you will know what to do or where to run to unlike at night when our systems are almost shutting down. Finally I want to learn a new language…I am still choosing among Spanish, Italian or German. And to say that I want to do all this before the year ends, would I be joking? Is it too much for one soul, Is it achievable or am I biting too much than I can chew? What do you think? I think Midlife crisis checked in a little too early.